SIDE EFFECTS: See also Warning section. Headache, tiredness, loss of appetite, nausea, vomiting, diarrhea, trouble sleeping, dizziness, or stuffy nose may occur. If any of these effects persist or worsen, tell your doctor or pharmacist promptly. Remember that your doctor has prescribed this medication because he or she has judged that the benefit to you is greater than the risk of side effects. Many people using this medication do not have serious side effects. Some people may experience worsening of a previous medical condition (such as an old infection) as their immune systems improve, or develop new conditions because their immune systems have become overactive. This reaction may occur at any time (soon after starting HIV treatment or many months later). Tell your doctor right away if you have any serious side effects, including: unexplained weight loss, persistent muscle aches/weakness, joint pain, numbness/tingling of the hands/feet/arms/legs, severe tiredness, vision changes, severe/persistent headaches, signs of infection (such as fever, chills, trouble breathing, cough, non-healing skin sores), signs of an overactive thyroid (such as irritability, nervousness, heat intolerance, fast/pounding/irregular heartbeat, bulging eyes, unusual growth in the neck/thyroid known as a goiter), signs of a certain nerve problem known as Guillain-Barre Syndrome (such as difficulty breathing/swallowing/moving your eyes, drooping face, paralysis, slurred speech). Tell your doctor immediately if any of these unlikely but serious side effects occur: mental/mood changes (such as depression), signs of pancreatitis (such as nausea, vomiting, stomach/abdominal/back pain, fever), easy bruising/bleeding, skin/nail color changes. Changes in body fat may occur while you are taking this medication (such as increased fat in the upper back and stomach areas, decreased fat in the arms and legs). The cause and long-term effects of these changes are unknown. Discuss the risks and benefits of treatment with your doctor, as well as the possible use of exercise to reduce this side effect. This medication can commonly cause a rash that is usually not serious. However, you may not be able to tell it apart from a rare rash that could be a sign of a severe reaction. Therefore, seek immediate medical attention if you develop any rash. A very serious allergic reaction to this drug is unlikely, but seek immediate medical attention if it occurs. Symptoms of a serious allergic reaction may include: rash, itching/swelling (especially of the face/tongue/throat), severe dizziness, trouble breathing. This is not a complete list of possible side effects. If you notice other effects not listed above, contact your doctor or pharmacist. In the US - Call your doctor for medical advice about side effects. You may report side effects to FDA at 1-800-FDA-1088. In Canada - Call your doctor for medical advice about side effects. You may report side effects to Health Canada at 1-866-234-2345. DRUG INTERACTIONS: The effects of some drugs can change if you take other drugs or herbal products at the same time. This can increase your risk for serious side effects or may cause your medications not to work correctly. These drug interactions are possible, but do not always occur. Your doctor or pharmacist can often prevent or manage interactions by changing how you use your medications or by close monitoring. To help your doctor and pharmacist give you the best care, be sure to tell your doctor and pharmacist about all the products you use (including prescription drugs, nonprescription drugs, and herbal products) before starting treatment with this product. While using this product, do not start, stop, or change the dosage of any other medicines you are using without your doctor\'s approval. Some products that may interact with this drug include: interferon alfa, probenecid, ribavirin, stavudine, zalcitabine, drugs that may decrease bone marrow function or lower blood cell counts (such as ganciclovir, trimethoprim, cancer chemotherapy including doxorubicin), drugs that may affect the kidneys (including NSAIDs such as ibuprofen or naproxen). 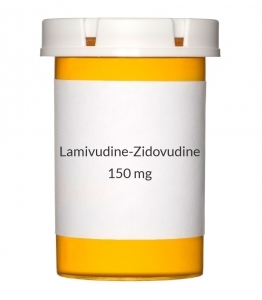 Other medications can affect the removal of zidovudine from your body, which may affect how lamivudine/zidovudine works. Examples include rifampin, valproic acid, among others. If you are also taking clarithromycin, take this medication at least 2 hours apart from your clarithromycin dose. Do not take other products that contain either lamivudine or zidovudine with this medication. Emtricitabine is similar to lamivudine and should not be taken with this medication. This document does not contain all possible interactions. Therefore, before using this product, tell your doctor or pharmacist of all the products you use. Keep a list of all your medications with you, and share the list with your doctor and pharmacist.